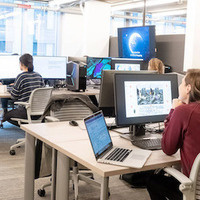 The new GIS & Data Lab is now open on the 1st floor of Rotch Library! The new lab has been expanded to include Data Management Services in addition to Geographic Information Systems (GIS). Come and meet the staff who support the lab and community members who use the space. There will be refreshments and demonstrations of software and equipment. Resources include virtual reality equipment, drones, GIS, statistical and visualization software packages. Stop by anytime during the event.